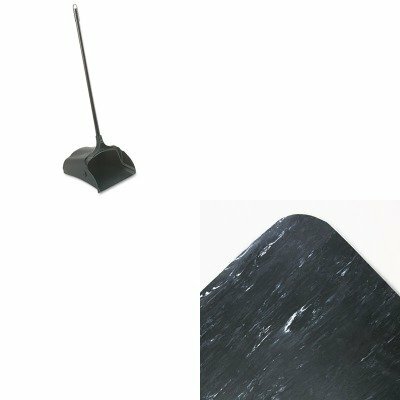 lt;stronggt;RCP253100BKlt;/stronggt;lt;BR/gt;Rubbermaid-Black Lobby Pro Upright Dust Pan, Open Stylelt;BR/gt;Wheeled, vinyl-coated dust pan with superior durability and ergonomic safety features. Yoke and handle assembly with larger, stronger and quieter hinge pins. Durable wheels and wear pads on back of pan extend product life. Built-in handle on back of pan lets you empty without touching pan bottom. Ideal for use in malls, restaurants and lobbies. Will not stain, discolor or absorb odors. Materials: Polypropylene with Vinyl Coated Steel Handle Width: 12 1/2amp;quot;.lt;BR/gt;lt;BR/gt;lt;stronggt;CWNCU3660BKlt;/stronggt;lt;BR/gt;Black Vinyl Spiffy Cushion Step Mat, 3' x 5'lt;BR/gt;When the job calls for spending a lot of time on your feet, it helps if you're on a comfortable surface. The marbleized rubber top fused to thick sponge foam helps relieve some of the discomfort of standing for extended periods of time. Features beveled edges and rounded corners to keep mat flat and help avoid dangerous falls. Mat Type: Anti-Fatigue Mat Application: Indoor Materials: Rubber.